On February 20th, Hobart residents will likely be surprised to encounter billboards on their city streets offering a challenge to Australians to reexamine their usual way of life. Set to run from February 20th to March 19th, the billboards combine stark, beautiful, black and white photographs with thought-provoking observations of fellow animals' inner lives and experiences. 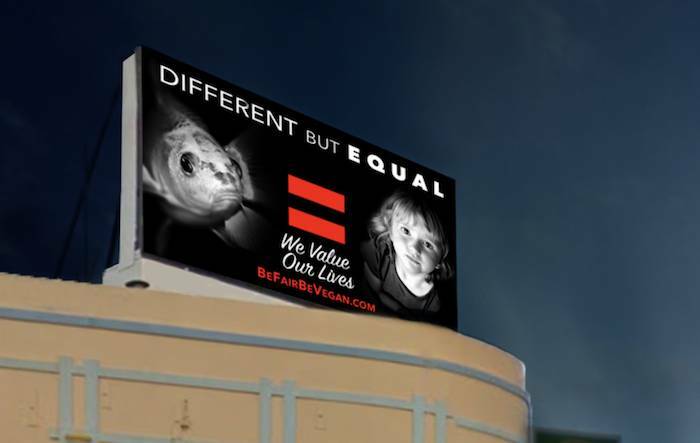 In August of 2016, Be Fair Be Vegan created a splash in the animal advocacy world, by releasing a powerful series of uncompromisingly vegan displays throughout New York City, including a stunning moving billboard in the middle of Times Square, one of the highest profile locations in the world. The displays are intended to introduce viewers to the faces and feelings of the animals we use, while inviting passers-by to consider the circumstances of the victims of the animal industry and see them for who they really are: not disposable resources to be used as commodities, but sentient beings who value their lives. Australia’s 300 abattoirs slaughter around 600 million animals every year. This is the equivalent of 1,000 every minute, and it does not include the millions of terrified individuals sent to their deaths elsewhere every year via live export, or the 12 million one-day-old male chicks suffocated or ground alive in hatcheries because they have no place as part of the egg-laying production line. The number does include almost one million male calves, infants considered ‘waste products’ of the dairy industry, taken from their mothers when they are still defenseless and vulnerable, and almost 20 million lambs, slaughtered at only six months old (the equivalent of a five year old child in human terms). The hope of these billboards is that they will help people to see that these figures are not just statistics. They represent a colossal number of actual animals, all of whom are individuals with faces, families and feelings, and all of whom, whether in the dairy, egg, meat or wool industries, and whether factory farmed, free-range, cage-free, or organic, end their lives in panic and terror as a result of our hardhearted attitudes toward them.